Nissan strives to develop technology that will enable a safer, more enjoyable driving experience for all. Nissan Intelligent Driving continues to push the envelope in AI development, combining sensing technology that monitors and collects information surrounding the vehicle, AI technology capable of accurately analyzing collected information, and technology that can control cars with precision. We’re committed to the realization of cars that handle precisely and according to the driver’s intentions, making the driving experience safer and more enjoyable. Smooth yet powerful acceleration, plus a linear response, delivering both comfort and an exhilarating experience: This can’t be accomplished by simply switching the drivetrain to an electric motor. It can only be achieved with Nissan’s accumulative knowledge in electric motor management, custom tailored to seamlessly engage with human sensitivity. Likewise, sustainable social mobility can only be accomplished with smart implementation of clean energy technology. Nissan will lead the dissemination of electric drive technology in the industry, based on Nissan Intelligent Power. As the connection between people and cars – as well as society and cars – becomes stronger, the role of cars will also expand, including the potential to become part of the social infrastructure. Nissan Intelligent Integration will establish new roles for automobiles as an integral part of society that contributes to the improvement of people’s lives, beyond just being a mode of transportation. Nissan remains committed to aggressively tackling issues that confront the automotive industry, such as climate change, air pollution, traffic congestion and traffic-related accidents. The company has accelerated the development of Nissan Intelligent Mobility to address these issues head on, as it continues to promote the joys of driving and traveling in a safe, comfortable environment. The IMx is not a concept vehicle mired in pure fantasy; rather, it provides a realistic peek into the future of Nissan Intelligent Mobility. The IMx takes the ProPILOT technology offered on the new Nissan LEAF a step further, by offering fully autonomous driving with no human intervention. With the newest autonomous and AI technologies, the driver can opt for fully autonomous driving by selecting ProPILOT Drive (PD mode). The system stows the steering wheel inside the dashboard and automatically reclines the front and rear seats, allowing the vehicle’s occupants to relax and enjoy their commute. The panoramic, curved display above the dashboard and the wood grain-patterned LCD display become a private entertainment center, allowing occupants to enjoy the scenery outside, watch a music video or even video chat with someone remotely, making full use of their time while traveling to their destination. When Manual Drive (MD mode) is selected, the steering wheel and seats return to their original positions, allowing the driver to take back control. The IMx offers the joy of driving and the pleasure of travel to both driver and passengers. The Human Machine Interface of the IMx is very simple. The switch from PD mode to MD mode, and vice versa, can only be done by using the PD Commander, located on the center console and steering switch. The displays and infotainment system can be controlled by gestures and eye movements. Intuitive controls and a voice command system allow drivers to focus on driving, allowing them to access various information in a smart, easy and safe manner. Beginning in 2020, Nissan will introduce new, dedicated electric vehicle platforms as it expands its EV model lineup. These platforms will boast truly efficient packaging, with all the mechanical components taking up minimal space, which in turn allows for an extraordinarily large cabin designed to provide maximum comfort for the vehicle’s occupants. Despite the presence of a large-capacity battery, the IMx platform has a flat floor, resulting in a cavernous interior. Also, thanks to Nissan’s vast experience with the Nissan LEAF and other electric models, the IMx boasts the handling prowess of a high-performance car. The new platform’s highly rigid nature translates to an excellent on-road feel, while the low center of gravity enhances the vehicle’s dynamic qualities, giving it a sharper turning response and enhancing overall agility. Powering the IMx is a pair of high-output electric motors placed at the front and rear of the vehicle, giving the vehicle all-wheel-drive capability. The motors combine to produce 320 kW of power and an astounding 700 Nm of torque, making the vehicle a powerful, yet quiet crossover. A new high-capacity battery, redesigned with increased energy density, results in a driving range of more than 600 kilometers on a single charge. This allows occupants to enjoy sporty driving without worrying about recharging the battery. With the excellent, straight-line performance and unrivaled agility, the IMx delivers an elevated level of driving excitement for all who sit behind the wheel. Along with electrification and vehicle intelligence, to achieve sustainable mobility, it’s essential for cars to become part of the social infrastructure. The IMx was engineered to establish unrivaled convenience and social integration by combining autonomous technology with connected-car technology and leveraging the vehicle’s high-capacity batteries to create a new role for cars. automatically share its power using vehicle-to-home or vehicle-to- building systems when it’s parked inside or near a building. It can also link to the local power grid. The high-capacity battery can then help stabilize electrical power frequency and act as a virtual power plant, contributing to the efficient use of renewable energy and energy management. 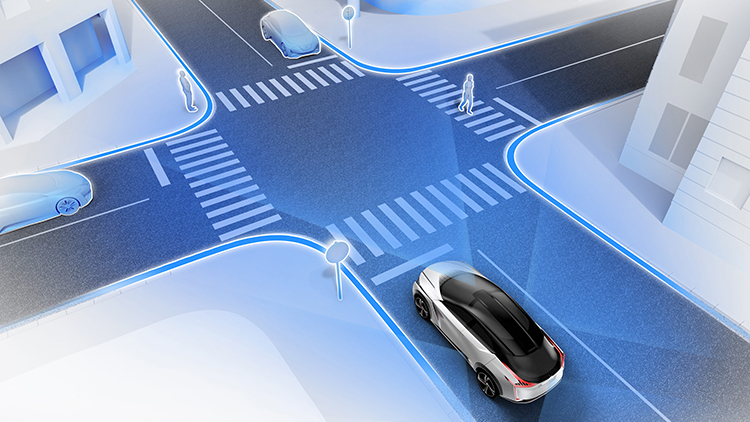 This future role of connected-car technology is demonstrated by Nissan’s Seamless Autonomous Mobility, introduced at the Consumer Electronics Show in 2017. SAM was designed to handle unpredictable situations during fully autonomous driving. The commands sent from the control center travel through a cloud-based database, allowing it to be shared with other autonomously driven vehicles in the vicinity. Although some critical circumstantial decisions need to be performed manually, the advanced AI system accumulates data for future use with the intent of providing smooth, incident-free autonomous driving. The IMx, a concept vehicle that embodies the future of Nissan Intelligent Mobility, provides a glimpse of what cars will be like in the future. With Nissan Intelligent Mobility, we’re committed to changing the way people and cars communicate, as well as how cars interact with society – helping build a more convenient and enjoyable driving experience for future generations.